We will be looking to place a few of our adult girls in the next few months. Each will have to go through their heat cycle and after a couple of months, they will be spayed. Typically when placing adults, we like to meet and spend a bit of time with families and see them interact with the dogs to see how the match might work out. We are looking for folks who have time to spend with the dog, all 3 have produced litters for us, they are Canadian Champions, hold Field Dog Jr titles and health checks have been done all before breeding. They are all used to living with other Vizslas. Dolly is a beautiful, energetic girl who has given us 3 litters. We purchased her from Calabri Vizslas in Ontario and was sired by our Drum. She is a Canadian Championship, holds a Field Dog Jr title and has a point in Canadian Field Trial - we only entered the one. She will want someone who can give her a fairly active life, she likes to point birds, spend time with her people and cuddle. She enjoys the company of other V's and gets along well with them. She is crate trained and has excellent recall. She will be 8 years old in March. She is currently finishing up her last heat cycle and is up to date on shots. Danica is the Princess of the 3. She is a full sister to Bella, but 2 years younger. She is a love bug through and through, she has a softer temperament than the other two, while she is used to living with all the other dogs, she enjoys playing with them one on one. Her favorite thing is to cuddle with anyone on the couch. She is crate trained and will be coming into season any day now. We do have 3 families currently interested in Dani. DANICA HAS A FAMILY WAITING!!. What will the new year bring for Egerton Vizslas? Fern's pregnancy has been confirmed, she will be due around Jan 27th and she is growing quite round! We also hope to breed Dolly in the next month or so, then Danica in the late summer. We will get Amico and Mazie back out in the show ring in the spring and possibly Tosa, Hopefully Amico and Tosa will also get out in the field. Our two seniors, Breeze and Romeo, are continuing to hold their own, but are really minding the drop in temperatures. Both do a lot of sleeping these days, some mornings they wake up and you would think they were still pups, so full of life, other mornings they are like Havelock and I, not too spry! Bree will be 14 in March, God wiling while Ro just turned 13 in October. One of the long overdue projects we hope to get done in the next few months is an update of our website. Sightcraft Design will be helping with this endeavour so check back from time to time to see how we are doing. Dec 26 2017 Merry Christmas and Happy New Year!! As 2017 winds down to make room for 2018 to roll in, we reminisce about all the happy times we have enjoyed with the dogs. Through them we have met so many wonderful folks. I look at Bree, the first pup born to us under the Egerton Kennel name, the only one of a litter of 5 left, she will be 14 on March 4th, God willing. Our Romeo, still as charming as ever but now without his sight, turned 13 back in October. Both still have lots of love to give and still know how to discipline the youngsters when they get too rowdy! We have been very blessed, not just with the dogs we have produced but also with the great dogs other breeders have entrusted to us. We look forward to welcoming in the New Year, and hopefully a new litter in Jan, nothing like a parcel of pups to make the winter go by! We look forward to seeing our dogs in the show ring (my health no longer allows me to show my own dogs), in the field and just running around our property enjoying life! We also look forward to meeting all the new folks who will come to meet our dogs this year, those planning on bringing one of our pups home and of course to seeing old friends who bring their dogs back for a visit with us. We would like to wish every one of you a safe and happy holiday season and all the Blessings a New Year can bring. Dolly and Newman have been bred, pups should arrive on Nov 26. This should be a great litter for performance in conformation and field. Tthey will also make sweet family companions. Steel/Newman presented us with 7 lovely puppies, 3 females and 4 males. All are doing well. We do not have any available pups at this time. Jun 23 2015 Bella/Newman Puppies ..
On June 18th Bella presented us with a litter of 10 beautiful puppies, 3 females and 7 males. This is a second litter for Bella, a first for Newman. This will also be Bella's last litter, she will be spayed and retired with her momma Blossom. On June 18th Bella presented us with a litter of 10 beautiful puppies, 3 females and 7 males. This is a second litter for Bella, a first for Newman. This will also be Bella's last litter, she will be spayed and retired with her momma Blossom. On Feb 5th Danica presented us with 7 females and 4 males, big litter for her first! All these puppies have gone to their new homes. Aug 29 2013 Corrie Has Found A New Family! Corrie has found a wonderful family. She will have two new parents who love the outdoors, brisk walks and running. She will also have 3 children to love her. They came to meet her and the girls played with her in the yard, she looked like she was in her element! She will go to her new home this weekend, giving her new family time to prepare for her and me time to say good bye to my sweet baby girl! Jun 24 2013 Puppies coming!! Dolly has been bred to River and puppies were confirmed via ultra sound. The new arrivals should arrive approximately mid July. Corrie will be bred to River in August for early winter pups. ...... have presented us with 7 beautiful pups, 5 girls and 2 boys on Jan 22, 2013! This is the breeding that produced River, Kwest, Bella, Steel and Cherry so we have huge hopes for these babies! Jan 23 2013 Congratulations to River and Richard! .............. for achieving not only a ranking of #1 Vizsla in Canada (following in the pawprints of his Uncle Edge and Great Uncle Ranger) but also for earning his Grand Championship! Steel/Murray presented us with a litter of 6, 4 girls and 2 boys. These pups, although unplanned, are all sold. Piper/Murray presented us with a litter of 11, 7 girls, 4 boys. We have females available on this litter. Contact me for more information. Dec 12 2012 River goes BIS!! October and Nov were very exciting months for us with River taking a Best In Show and a Reserve Best In Show in PEI(HUGE thanks to Judges Joan and Melvin Beech), earning 20 straight Group placements along the way. In November he earned his CGN to complete his Grand Championship Title!!! December will be equally as exciting with Piper's pups due on Dec 21 and SUPRISE!! Steel will apparently be presenting us with a litter next week as well (sometimes that Murray can be such a Hound dog) Watch Marquee and Facebook page for announcements and pictures. October and Nov were very exciting months for us with River taking a Best In Show and a Reserve Best In Show in PEI(HUGE thanks to Judges Joan and Melvin Beech), earning 20 straight Group placements along the way. In November he earned his CGN to complete his Grand Championship Title!!! December will be equally as exciting with Piper's pups due on Dec 21 and SUPRISE!! Steel will apparently be presenting us with a litter next week as well (sometimes that Murray can be such a Hound dog) Watch Marquee and Facebook page for announcements and pictures. Ch Calabri Egerton's Drummer Girl - aka Dolly, won Open Derby as well as Judges Pick of the Stakes! Cherry won 1st Test, Highest Scoring FDJ with a 99, Bella won Highest Scoring FDJ Vizsla in the 2nd Test on Sat and Mr Kwest won Highest Scoring Vizsla in FDJ in the 4th Test! Miss Blossom tied for second place on the morning of the first test with a 97. All, owner handled, completed their Field Dog Junior titles! Frankee has given birth to 12 beautiful pups, 6 of each, ready to go week of September 17. We are now taking deposits for this litter. Exciting news! Ultra sound confirms that Frankee is indeed having pups. This litter would be due approximately July 22, ready to go 8 weeks after that. Romeo and Piper produced 7 beautiful babes on May 23, 2012. We have 4 boys and 3 lovely little ladies. Due to a cancellation we have one female available. Romeo has been bred to Piper for a repeat litter, pups would be due approx May 20 ready to go approx July 20th. Reservations are now being taken. Mar 19 2012 Great weekend at the Show! We would like to congratulate Richard and Reba on earning 2 Qualifying scores toward her Rally Novice, Richard/Shayla and River for his Group 4th on Sat and his Group 3rd on Sunday. Also congratulations to Shayla for finishing Dolly's Canadian Championship. Our Baby became a Champion on her 1st birthday. We are very pleased to be part of the newly formed Atlantic Pointing Breed Club and to announce our first Canadian Kennel Club sanctioned Field Trials and Tests to be held at the grounds of Darren Miller (Firefly Kennels) weekend of September 21, 2012! Nov 13 2011 Bree/Romeo pup is here! Bree produced one healthy baby girl. This is her last litter, she will be spayed before her next heat cycle. We are proud to announce that Brig, Frankee and Murray all completed their Field Dog Jr titles at the Vizsla Society of Ontario Field Test! 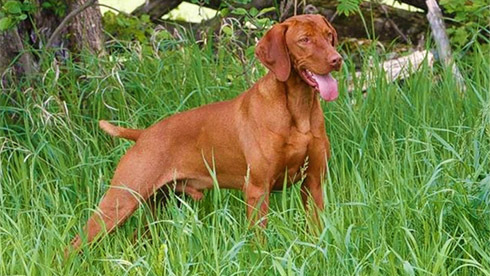 Corrie, at 9 months old, completed her FDJr title at the Vizsla Canada Field Test earning High Score with a 96 on Sunday and Fire, at just 6 months old, earned the first two legs of her FDJr. Piper had 9 beautiful pups on March 15, 6 boys and 3 girls. We do have 2 males and 1 female (higher energy) available from this litter, ready to go May 10th. We are travelling to Ontario on May 17 and can take pup up with us to save you shipping charges. This is our last planned litter until Dec, 2011. Piper had 9 beautiful pups on March 15, 6 boys and 3 girls. We do have 2 males and 1 female (higher energy) available from this litter, ready to go May 10th. We are travelling to Ontario on May 17 and can take pup up with us to save you shipping charges. This is our last planned litter until Dec, 2011. Nov 13 2011 Congratulations to Edge, Blossom and Charlee!